Hot Toddy flavored coffee is the perfect way to unwind after a long day. With a warm cinnamon flavor, other warm spices like nutmeg, sun kissed citrus, and a little bit of liqueur infused undertones, this Hot Toddy flavored coffee has the flavor that will calm your nerves and relax your soul. With only 2 calories in each cup, you can�t go wrong with this aroma-filled 100% Arabica bean flavored coffee. Sealed in a heat-sealed valve bag, this Hot Toddy flavored coffee will be roasted and shipped on the same day. 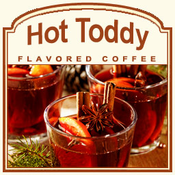 For a flavored coffee that will keep you warm and toasty, the Hot Toddy coffee will deliver with its slightly spicy cinnamon taste. Mmm � cozy and delicious!